WIMBLEDON, England — Just two guys out playing tennis at the All England Club Sunday. Sure, their names happened to be Novak Djokovic and Robin Soderling, and it’s very possible that seven days from now, those two won’t be on practice court No. 1, but instead a few hundred yards away, on Centre Court, playing in the Wimbledon final in the most important tennis match of the year. Soderling served, and then ran Djokovic around the court, back and forth, until Soderling finally crushed a forehand winner. When the ball got past Djokovic, who was on a full-out run, he wound up and threw his racquet all the way across the open court next to them. The second Monday at Wimbledon, tomorrow, is the most exciting day of the year for tennis, with only the U.S. Open’s Super Saturday as competition. But on Monday, all of the final 16 men and 16 women will be playing. So the order of play includes Sharapova vs. Serena Williams, Henin vs. Clijsters, and also Federer, Nadal, Murray, Roddick. So much tension, so much at stake. Welcome, Rafael Nadal. With just half a week left of the French Open, he finally arrived. Turns out, what he needed was a real threat today, not one looming a week or more away. So Nadal had been moping, losing confidence, seemingly burned out for the first week and a half, trying to figure out what, if anything, he could do against Novak Djokovic in the final. And then on Wednesday in the quarterfinals, facing No. 5 Robin Soderling, the only man to ever beat him in the French Open, Nadal finally was Nadal again, winning 6-4, 6-1, 7-6 (7-3). It set up a dream semifinal for the French, with all top four seeds alive: Nadal-Andy Murray and Djokovic-Roger Federer. The pressure has been getting to Nadal, mostly from Djokovic, who is trying to take Nadal’s tournament and also his No. 1 ranking. 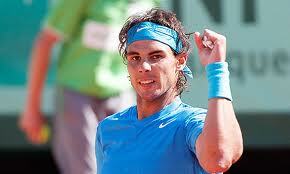 Nadal also needs one more title to catch Bjorn Borg’s six French Opens. If that pressure wasn’t enough, he also has been trying to adapt to the French’s new Babolat tennis ball. It is harder and flies faster than other balls, and Nadal has had trouble controlling it with his heavy topspin.